Villa Isla is not only exquisite, it feels like heaven on earth. Large palm trees line the entrance, and the cooling ocean breeze wraps around the house. Each of the equal master suites has sliding glass doors that open to the mesmerizing turquoise ocean views. Dining here is always a delight whether you’re dining inside or out, you’ll never be without the stunning views. The water of the infinity pool looks as if it is pouring into the ocean below, and the hot tub sits adjacent for an evening soak under the stars. Beachfront! All bedrooms have views! 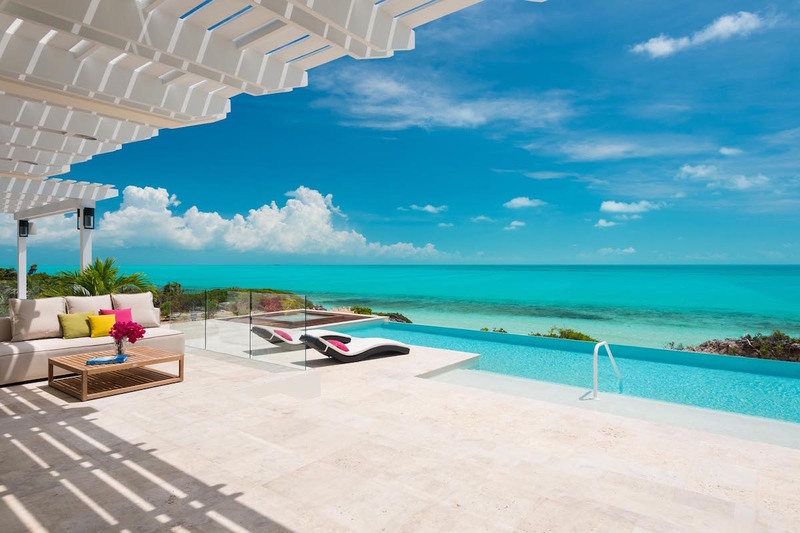 Villa Isla is elevated above Long Bay Beach, with breathtaking ocean views and three miles of powder soft sand mere steps away. This fully air-conditioned, two-story villa is ideal for a couples or extended family vacation. Relax outside in one of two sitting areas on either side of the deck, or sunbathe in one of the loungers. The Seaview Terrace sits behind the pool terrace, and has outdoor living and dining. Around the corner, there’s additional dining space by the BBQ grill. The long infinity pool has a wading area and a lap area, and a hot tub sits adjacent, all facing the sea. A private staircase leads down to the beach, where guests can lay out on the sun deck or snooze in the shaded hammock. There’s kayaks to take out on the water, and miles of beach to walk along. Understated, elegant decor allows the ocean view to be the villa’s main focus. Spend time with loved ones in the living room’s lounge, or watch movies on the 52-inch flat panel TV in the media room. The indoor dining table seats 8, and lies across from the gourmet kitchen. Stainless steel appliances and a marble countertop add to the kitchen’s chic design. Each of Isla’s bedrooms are Master Suites, and two are located on the ground level. They each have king-sized beds, spacious ensuite bathrooms, TV, and access to the pool deck. Upstairs, there are three other king bedrooms with ensuite bathrooms. Two of the bedrooms open to private balconies, and one bedroom opens to the gallery. Long Bay is mostly residential, and the beach is one of the island’s up and coming, known for kite-surfing. Busier, more developed Grace Bay is less than 10 minutes away, with several beach bars, restaurants, and activities to choose from. Guests are provided with a $500 dollar allowance for A/C. Any AC overage is an additional charge. There is a $1,000 + tax charge to heat the pool. Car rental, private chef, butler, server, daily maid service, grocery and beverage shopping (pre-arrival and during your stay), liquor and wine delivery, nanny service, baby equipment, spa services, yoga and personal training, photography, and private airport transfer/car service can be arranged for an additional fee. Absolutely stunning, worth every penny spent! Words cannot describe how happy all of us were at Villa Isla! The pictures don’t lie, this is a stunning villa with every amenity needed. The views, the beach, the heated pool, and everything else is excellent. The house is beautiful. Of all the houses I have rented, I have never stayed anywhere that made my stay so comfortable. The little extras like paddle boards, kayaks, snorkeling equipment, laundry detergent, full bottles of shampoo, bathroom necessities, sunscreen, and bug spray proved that the owners have really thought of everything. The location is great, as it is a short drive to local restaurants. Overall, we loved our stay and would highly recommend Villa Isla. WhereToStay’s team is so organized and were constantly reaching out to remind us of upcoming things to think about. They’ll help you schedule groceries, reservations, etc. Our flight in was delayed, so one couple arrived hours before the rest of us and didn’t have a car. Faye picked them up from the airport and took them to the grocery store before taking them to the house. WhereToStay really goes above and beyond to take care of every need. We spent 2 weeks at Villa Isla and have nothing but praise for everyone who helped with our vacation plans. The management staff at the villa especially Michelle were so helpful and friendly. The villa is perfect, and the beach setup was amazing. We will not hesitate to go back again. It is truly paradise! Shawna met all our needs to perfection, like baby rentals, chef, and car rental. We will continue to use WhereToStay.com and Shawna. Even though the weather wasn’t ideal, the house more than made up for it! The pool table, hot tub, hammock on the beach, kayaks, and trampoline in the ocean, my list could go on. I’d stay in this house again without hesitation. It is a little secluded, but that’s exactly what we wanted! Love Andrew! It was our second time to book a house in Turks with Andrew, and we’re getting ready to book again this summer with him. Andrew was wonderful and very helpful. I used his recommendations to book dinner reservations. Isla filled all expectations & then some! This was our first time to visit the Turks. We used WheretoStay & had a perfect experience from the start. Upon arrival we were greeted & given a thorough tour of Villa Isla. It was very clear how to work all the amenities. The view is indescribable. All I can say is a color blue that I’ve never seen before! The floor plan is perfect! Every suite has a breathtaking view. It was great for our family. We never needed air condition as the ocean breeze that flows through the giant doors and windows felt great. The beach access is awesome and the pool and hot tub were just right. We can’t wait to hopefully visit here again! Andrew is awesome! He took such good care of us and made us feel so comfortable with a very large purchase. He also was extremely helpful in what to do and where to go while we were in the Turks. His customer service trickled all the way down to those who cared for us while we were at Villa Isla! We felt very taken care of and will absolutely use Andrew again for future trips! I can’t say enough about the outdoor space, kitchen, and beach! It was absolute perfection. The pool was a bit chilly, so we had to pay $1,000 a week to heat it. We had to fill the pool almost every night because there was a leak. But, the size was perfect for us and we loved the hot tub. The reason I gave a 3-star is solely on the mattresses. Everyone was complaining after the first night about the mattresses. These were the absolute pits. They really need to replace these. My husband ended up sleeping with pillows underneath him. Not what I expect from a high end rental! I will also say in my years of travel I have only left one bad review. So it’s pretty bad if I complain about something.